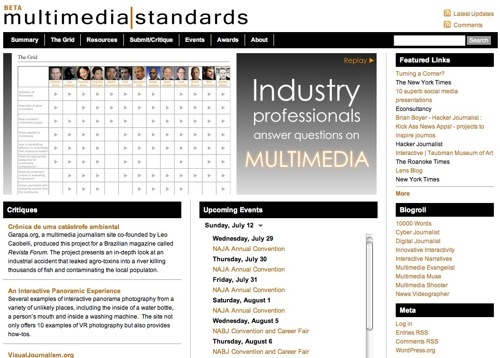 After some teasing on Twitter (with the recently neglected #multimediastandards hashtag), we’re now ready to announce the beta launch of Multimedia Standards! A clean and simple home page, with The Grid front and center. We began the project in late March and launched in private beta in May. Thanks to everyone for their feedback! There are plenty of Web sites and blogs devoted to multimedia journalism, and many of them are great. But there’s no single hub to discuss, share, critique, rate and learn about the field – including in-depth thoughts from industry leaders. That’s the hole Multimedia Standards aims to fill. But what about the name: Multimedia Standards? The site offers none. Instead, we offer resources and opinions on everything from “what is multimedia” to “what is good multimedia” and beyond. Users can listen to an international group experts in an interactive grid; submit and critique projects; find other sites on our resources pages and easily subscribe to them (we provide the RSS feeds); see upcoming events on our calendar; and read about upcoming contests and recent winners. User input, from critiquing multimedia projects to saving links in our Publish2 newsgroup (which feeds to the top-right homepage widget), is key and we plan to continue updating the site with more featured links. Events – a Google calender with upcoming conferences, training events, etc. Your interaction is key to the site being more than just a static presentation of our work. For example, submitting and critiquing projects, adding events and more. Let me know if you’re interested in learning anything more about the site; I’ll respond via the comments or write another post, if the questions warrant. Also, please comment with feedback. How can we make the site better? Looking forward, there’s a second round of interviews in pipeline, which will be used to create a second grid. Although I’ve graduated and won’t be directly involved with that, I’ll be sure to post an update when part deux launches. I’ll be in Washington, D.C. for the next few days, courtesy the University of Miami School of Communication, so the blog will probably be quiet. I’ll be working on a couple video profiles of National Park Service employees with a fellow student (I did a similar project — but as an audio slideshow — last year at Everglades National Park). I’m not a big fan of the redesigning Craigslist idea, but it should be a great event. As always, I’ll be wearing my CoPress hat and looking out for any takeaways that could be useful for college media. Any thoughts in that realm will appear on the CoPress blog. I may liveblog and/or livestream parts of the event. If I do, I’ll be sure give as much notice as I can. PS. Yay for spring break! But it’s about a week too short. Live video from the WeMedia 09 Pitch It (for-profit) session, including Cody Brown‘s (@codybrown) Locccal idea.